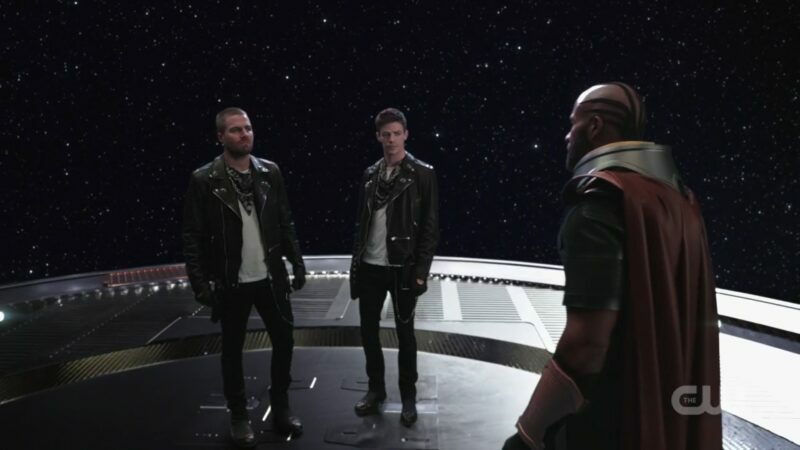 The Monitor (LaMonica Garrett) pulls Oliver (Stephen Amell) and Barry (Grant Gustin) in for a quick council. Image courtesy of The CW. The thrilling Elseworlds crossover comes to a conclusion on Supergirl and there’s something different going on right out of the gate. Instead of hearing Kara’s story, the intro is being done by John Deegan, who is apparently now Superman. Oliver and Barry try to point out that he can’t just make himself a hero. To drive the point home, they give him a situation that they have both been in many times. By causing a crane to fall towards a crowd, Deegan has to make a choice: save the people, or stop Barry and Oliver. Thankfully, he does the right thing and helps the people, allowing Oliver and Barry to escape for now. John Diggle (David Ramsey) and Caitlin (Danielle Panabaker) have become Superman’s minions. Image courtesy of The CW. S.T.A.R. Labs is now Superman’s headquarters. John Diggle and a silver-haired Caitlin are part of his team. He’s upset that the fugitives got away, but they assure him that he is all powerful and will catch them. A disturbance in the pipeline has Deegan going down to check it out. As we saw in previews, Kara is locked in one of the cells. She knows that the man she sees is not Clark. Deegan points out that she was a better hero than Oliver or Barry. While he knew all about them, he knew nothing of Kara or Superman. His book had no info on them, as if they weren’t from this world. Alex is an agent on patrol in the meta prison, but she shows only disdain for Kara before being dismissed by Deegan. He tells Kara that if she’s not a model prisoner, he’ll kill Alex. Barry and Oliver go to find Cisco in hopes that he will breach them to Earth 38 so they can get the real Superman. When they attempt to enter his apartment, they instead step out onto a platform outside time and space. Here they are greeted by The Monitor. For whatever reason, he tells them that his interest is piqued. Even as ordinary humans, they managed to outwit Superman. He tells them there may be hope for the universe yet, then he simply sends them back. Barry says that it stands to reason that if they’re good guys gone bad, then perhaps Cisco is now a bad guy, too. They go to a bar where the bad crowd is known to hang out and are surprised to see most of the people there seem afraid of them. One person who isn’t scared is the bartender, Gary. Yep, Gary from Legends of Tomorrow! In a cute twist, he calls them “legends.” (Yeah, writers. We see what you did there!) (As a note, Oliver, Barry, and Kara all tried calling the Legends. Ray scoffed about how it was for the “annual crossover” and the broken timeline versions of themselves chose not to help out.) Gary points them in the direction of Cisco, who happens to be the boss, in a corner booth, counting money. Legends of Tomorrow’s Gary Green (Adam Tsekhman) makes an appearance as fanboy bartender. Supergirl sees Alex on patrol and calls her forward. She tries to explain that she’s not from this Earth and that in her world, they are sisters. Alex has no time for this and simply closes the viewing door, so she and Kara can’t see each other anymore. Talking to Cisco doesn’t go very well, especially since he prefers to be called Mr. Ramon now. Annoyed by the people trying to get his attention, Cisco’s muscle takes notice. Turns out his security guy is James Olsen. Barry and Oliver assume they can take him, but they assume wrong. Before James can take them out in the alley to kill them, Barry says he knew Dante, Cisco’s brother. That brings everything to a halt. Barry says Dante would want him to listen to their proposal – the opportunity to get rid of Superman. In Cisco’s office, they ask if he can still vibe, which thankfully, he can. He’s been using his powers to break into bank vaults. Barry offers to teach him how to use those powers to get to a whole different Earth. Cisco is intrigued. After 17 tries, Cisco is finally able to breach them to Earth 38 to Superman and Lois Lane. Cisco (Carlos Valdes) is living a crime-boss life now. Image courtesy of The CW. Outside of Kara’s cell, she listens to a conversation between Alex and Caitlin. Caitlin is trying to get Alex to leave, but she won’t. Also, she’s apparently been dating guys. (I wonder if this Alex is struggling with her sexuality just like the other Alex did.) When Alex opens the viewing hatch, she sees Kara attempting to use her cold breath to escape. A press of a button does something that causes Kara pain and she screams out a rhyme in another language, one that her Alex had taught her. Luckily, this Alex had the same memory of how she learned it. Kara tells her all about her Alex and how amazing she is and how she knows this Alex is just as amazing, even if they aren’t sisters. After telling Alex about how Superman rewrote the world, Alex agrees to let her out so Kara can go stop him. They don’t make it far before running into Deegan, Diggle, and Caitlin. Alex willingly says she and Kara are sisters now and that just leads to Deegan saying they’ll both burn. Just as he’s about to shoot them with his laser eyes, Cisco, Oliver, Barry, and the real Superman show up. The two Supermans (Supermen?) go shooting through the roof in battle. Cisco takes off while Oliver gets drug into the elevator by Diggle and Caitlin. Barry, Kara, and Alex go to search for the book. Alex says that anything valuable to Superman would be kept in the Fortress of Solitude, which just happens to be the time vault, the secret room of S.T.A.R. Labs. That’s where they find the book and lucky for them, it’s unlocked this time. However, it’s too powerful for even Kara to look at, so she takes it to Clark. The Superman battle is raging across Central City, and the real one is actually not doing so well. Kara shows up just in time to save him from a punch, shooting Deegan with her laser eyes and knocking him into the distance. She gives him the book and a white-blue light starts swirling around and things begin to change. Kara is back in her Supergirl outfit and Barry ends up back in his Flash suit. The elevator opens up and Oliver is once again the Green Arrow, complete with bow. Diggle and Caitlin are unconscious. For a moment, Clark (Tyler Hoechin) is able to set some of reality right. Image courtesy of The CW. Back at S.T.A.R. Labs/Superman headquarters, Barry suggests that they slow down time. He says that if he and Supergirl go around the globe at just over Mach 7, it will slow the Earth’s rotation. They agree to do it, but Superman tells them he saw them do that in the book and when they did, they both died. Without any other options, they try it anyway. Oliver tells Clark to get the book and he goes to talk to The Monitor. He tells Mar Novu that he wasn’t testing how strong they are but how good they are. He points out that while he himself is filled with darkness, Barry and Kara are good. They are the ones that should be saved because they are the ones who will stand up against whatever being is coming – they are the ones he needs. The Monitor tells him that balance must remain. One change begets another and he asks Oliver what he thinks should happen. Clark approaches Deegan as he is changing things, but he can’t even get close. Deegan creates an A.M.A.Z.O. like robot. After Clark fires his eye lasers, it does the same right back, knocking him back into a car. That’s the moment a breach opens and Braniac, J’onn, Lois Lane holding some kind of hammer, all walk through. Brainiac takes on the robot while J’onn goes to save the civilians. Lois uses the hammer on the ground and it causes Deegan to drop the book. He’s quick to pick back up though, aiming it at the couple. Lois goes flying through the air. That’s the moment that Barry and Kara’s efforts take effect. They are burning away, but the world slows. Help arrives in the form of Brainiac (Jesse Rath), Lois Lane (Elizabeth Tulloch), and J’onn (David Harewood). Image courtesy of The CW. Oliver shows up with a special blue-tipped arrow. He fires it into the book and it creates an explosion of blue light, causing all the effects to fade. Time resumes and Barry and Kara are fine. Clark is able to catch Lois and Deegan turns back into his former self, but with a deformed, burned face. The book still exists, but no longer glows. All is good in the world again. Kara points out how this has become an annual thing and Barry hopes it doesn’t continue. (Sorry, Barry! The fans love it!) Oliver is begrudgingly smiling and admits to liking Kara and Barry, but tells them not to tell anyone. Kara, J’onn, Lois, Clark, and Brainiac take a breach back to their Earth. Back on the farm, Clark breaks some news to Kara. He and Lois are having a baby. Since the baby will be half Kryptonian, the safest place for Lois to be when the baby starts kicking would be on Argo, the remaining Kryptonian colony. There, the baby won’t have super strength. They aren’t just staying there for the pregnancy though. Clark is hanging up his cape for a while and leaving the world in Kara’s hands. Oliver (Stephen Amell) and Barry (Grant Gustin) can finally take a moment to relax and enjoy a victory beer. Image courtesy of The CW. Oliver ends up getting a call from Kate Kane. She asks if the doctor, who is now a patient in the asylum he used to work in, is going to be an issue. It seems he’s made a friend. The patient who wore the gold mask and whacked Barry with the baseball bat before getting in the van tells Deegan that all is as it should be and that the universe will never be the same. For those curious, this character is Roger Hayden, a.k.a. Psycho-Pirate. Psycho-Pirate (Bob Frazer) looks to be a big part of next year’s crossover, Crisis On Infinite Earths. Image courtesy of The CW. This leads up to a title promo for next year’s crossover – Crisis On Infinite Earths. Wow! What a ride we went on for Elseworlds! Not only did our heroes save the world as usual, but we got to meet a couple of new characters in the process. While Lois Lane might not be seen as often, we should be getting more of Batwoman and that is definitely something to look forward to. What did you think about the crossover event? Anything you wished they would have done differently? Any lingering questions? Let us know in the comments below! Next year’s crossover is already titled – Crisis On Infinite Earths. Image courtesy of The CW. “Engage: The Official Star Trek™ Podcast” Launches Today! Previous story Interview: Jason Manns Talks Music, Producing, Richard Speight, Jr.’s Album, His Favorite Memory Singing with Rob Benedict & More!